Why does a big company like Oracle use such sleazy tactics to take advantage of people? Oracle's Java is everywhere, even though you never see it. For the most part, it's an invisible technology that lives behind the scenes, so unless you're a programmer, you won't even need to know it's there. That is, of course, until you get a notice telling you that your Java is out of date. 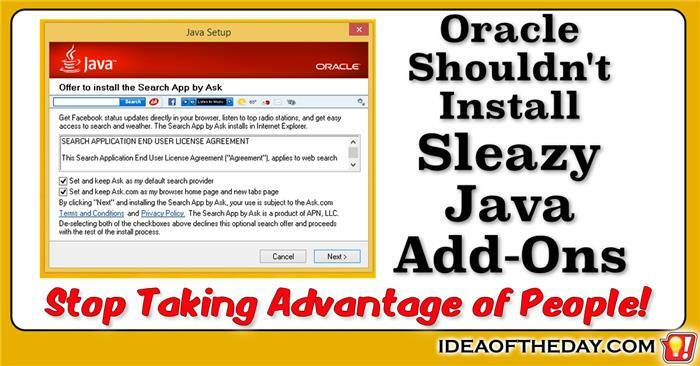 As a behind-the-scenes technology, you would think that getting the latest version of Java would be something harmless, but it's not, because Oracle decided to use sleazy techniques to try to earn some additional revenue by installing bogus add-ons and hijacking your default search engine.